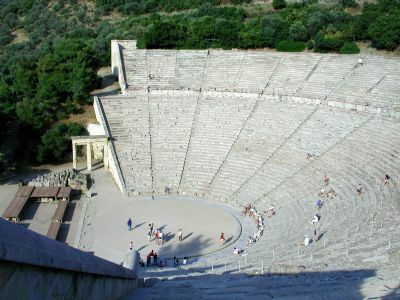 The theater at Epidaurus is one of the most famous and well–preserved in Greece. It was constructed in the fourth century B.C. and continued to be used into the fifth century A.,D. Since the nineteenth century is has been excavated and restored. It could seat about 14,000 people. The theater was used for musical and dramatic presentations.